Fully staged opera, intimate chamber music, jazz, bluegrass, pops—there’s something for every musical taste at Brevard Music Center’s milestone 80th anniversary season this summer. What started in 1936 as a music camp for 50 boys has matured into one of the country’s premier summer institutes and festivals. Through the years, such classical and contemporary luminaries as Itzhak Perlman, Yo-Yo Ma, Frederica Von Stade, Garrison Keillor, and Marvin Hamlisch have graced BMC stages. This summer’s lineup features world-class virtuosos performing with more than 400 students in 80 concerts spanning 10 weeks. “If you’ve never experienced BMC, this is the year to go,” says spokesperson Cally Jamis Vennare. The anniversary is prompting the festival to pull out all the stops and include performances by many of its alumni. Roots run deep at BMC. Alumni who go on to professional careers return year after year to teach and mentor the next generation. 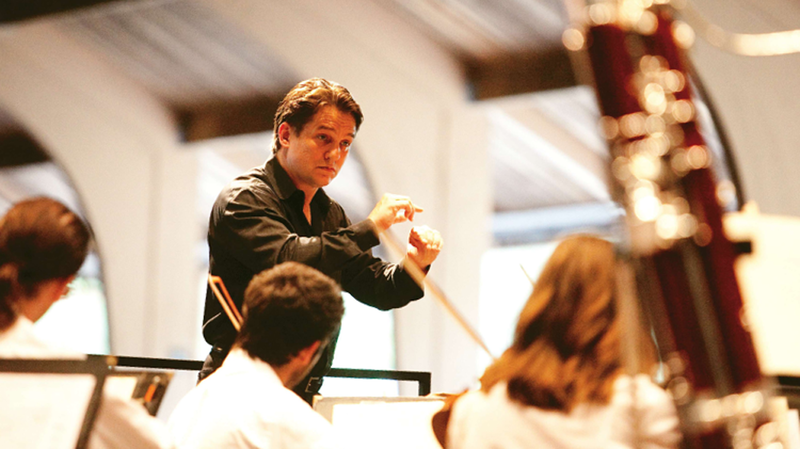 Certainly BMC’s most distinguished alum is Artistic Director Keith Lockhart, who is also Music Director of the prestigious Boston Pops and the BBC Orchestra in London. One of the festival’s most anticipated musical reunions happens on July 16, when two old colleagues and alumni—conductor Robert Moody and composer Mason Bates—perform Bates’ “Rusty Air in Carolina,” an electronica composition inspired by his WNC visits. Other highlights include Dvorak in America, a program celebrating the Czech composer that will feature rising star JoAnn Falletta conducting A New World Symphony on July 30. August 4 brings Some Enchanted Evening: The Music of Rodgers and Hammerstein. And for a truly grand finale, on August 7, Lockhart will conduct Beethoven’s exhilarating Ninth Symphony, featuring alumni soloists and a chorus of local singers. Festival events are held at several locations on the BMC campus and Brevard College. With tickets starting at $15 for lawn seating and free entrance for youth under 17, admission is family-friendly. To take in the complete BMC experience, bring a picnic and dine under the stars.